Succulenta, Netherlands74e (1) 38-44, 1995. Basionym: Sclerocactus blainei Welsh & Thorne, Great Basin Naturalist 45 (3):553-555, 1985. Type: (of Sclerocactus blainei) Nevada: Nye Co., T10N, R58E, 1,6 km NE of Currant, 1,617m elev, 23.May 1981, Welsh 20580 (Holotype BRY). 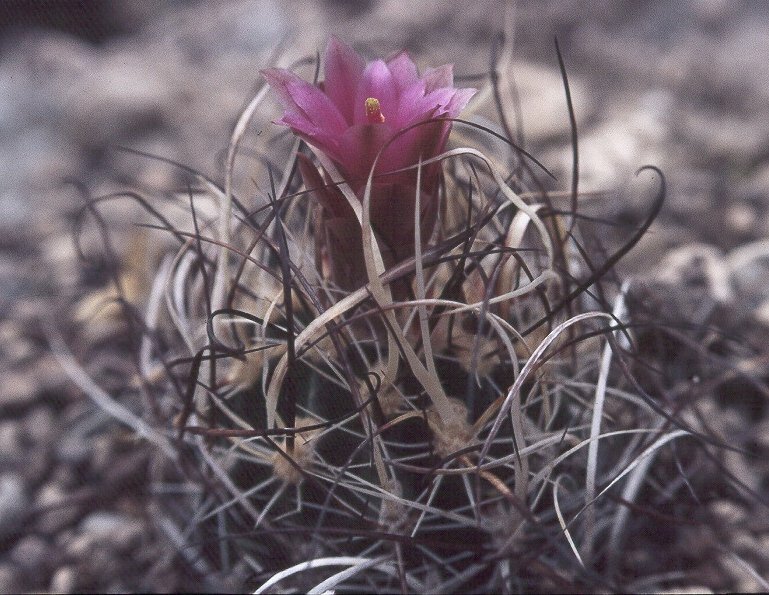 Type: (of Sclerocactus schleseri) Nevada, Lincoln County, Tertiary lacustrian deposit at ca. 1,464 m in salt desert shrub-grass community, 16 June 1983, Heil s.n. (Holotype, BRY;Isotype NY). Sclerocactus schleseri Heil & Welsh, Great Basin Naturalist, 46 (4):677-678, 1986. Sclerocactus spinosior (Engelmann) Woodruff & L. Benson var. schleseri (Heil & Welsh) Hochstätter, Succulenta, Netherlands, 71 (1): 247-262, 1992. Nachtrag Sclerocactus spinosior var. schleseri und Sclerocactus nyensis 72 (3):143, 1993.